My kids are counting the days til school is over. We are officially into single digits! 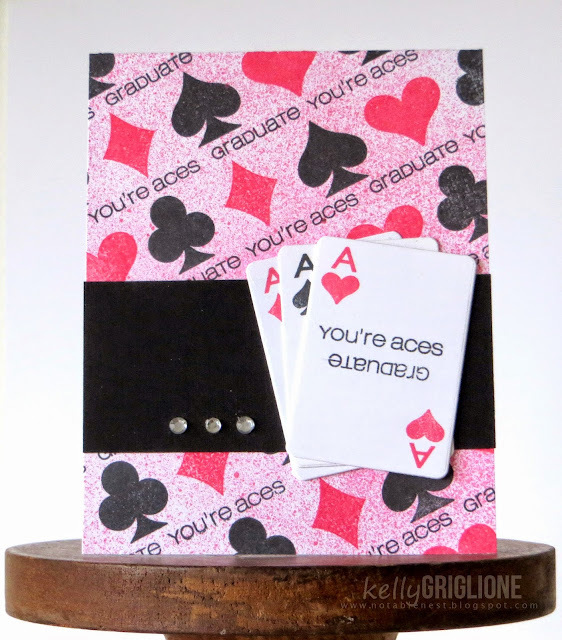 and I think this one from Girl Friday Kelly using our In The Cards is ACES!! I just LOVE how she created her own background by stamping the card symbols and sentiments over and over. It looks awesome!!! By using our Shuffle Fri-Dies, she cut out her cards and then stamped them. What a super fun graduation card!! I'm so happy to tell you we finally have the Heartbeats stamp set in stock! The big brown truck delivered it yesterday! Can I get a woot woot?? We have a few new local scrapbook stores that are now carrying our goodies! I can't believe kids are already getting out of school...mine don't until June. What a FUN card by Kelly! LOVE it. Mine are out in June, as well. I do need another good graduate stamp as both my boys are graduating this year. Lots of cards need to be made for their friends. I've been used RAD and Woot-Woot.